Want your words to reach millions of people? Goodreads and the ¡POETRY! group have partnered to host an ongoing poetry contest. Join the ¡POETRY! group and vote each month to pick a winner from among the finalists. You can also submit a poem for consideration. 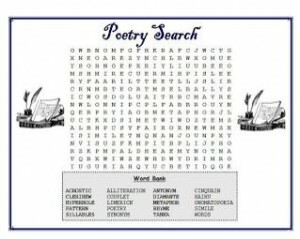 In recognition of National Poetry Month Click the picture for a complete poetry unit for grades 4-8. Click here for inviting poetry prompts from Melissa Donovan‘s Writing Forward. See also this archived post on Spine Poetry for an entry or closing project for poetry across the curriculum and grade levels. Here is a SooMeta video I made for Poetry introduction, recap, reflection, or unit closing. It is also good to use for writing practice, even for background during Open House!